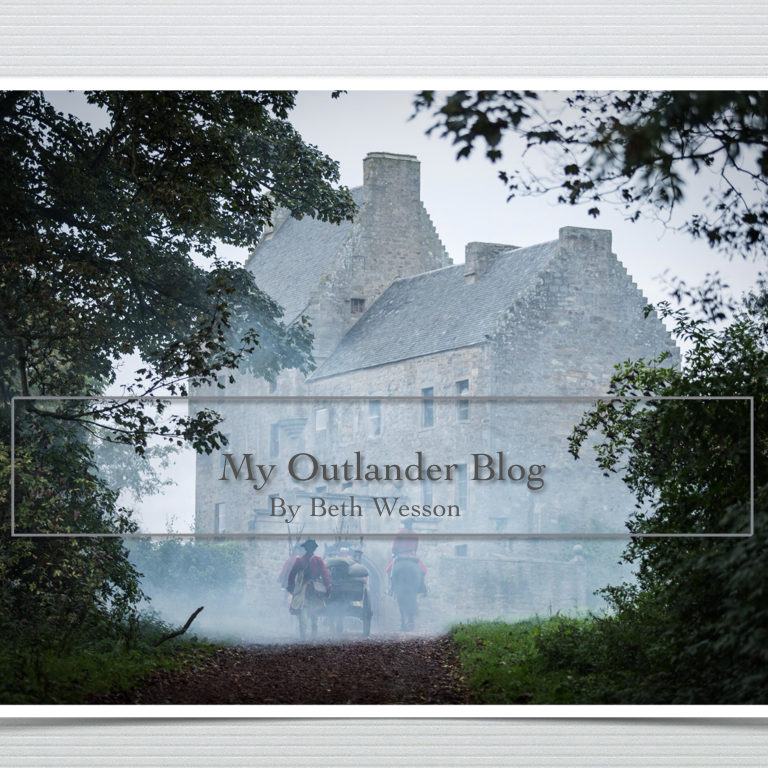 Outlander featured fan – My Outlander Blog! 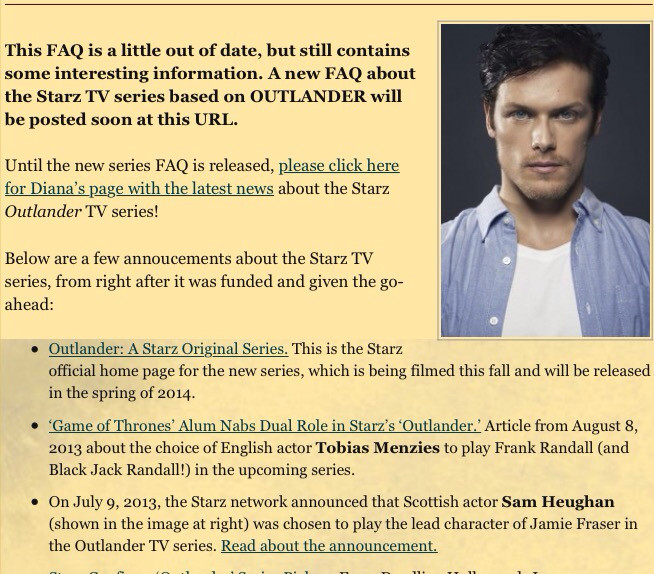 You probably already know this, but there are a lot of interesting and talented folks out there in the Outlander fandom! I was discussing this with some friends and we decided it would be great if the blog could feature some of those very same folks! 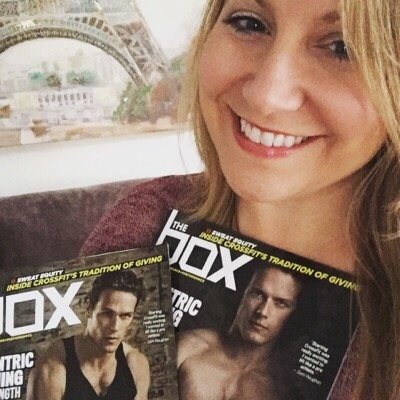 So, in the spirit of the New Year and resolutions, we decided the first featured fan would be our favorite “Sparkle Girl” Alisa Hinton! January is here and it came in with a bang! Happy New Year all! A new year brings new opportunities and so, now we ask ourselves, what to do, what to do? I decided to start January off by going vegetarian for a month. I knew I couldn’t go vegan or gluten free. I am not an all or nothing person. In fact, I am quite the opposite, but I figured you can do anything for a month right? And you know what? So far so good! I am also very lucky that I do not have to have a restricted diet for health reasons. I am doing it to challenge myself and adapt a healthier way of life. Last week, PBS aired a special called In Defense of Food. It’s based on a fabulous book written by Michael Pollen. I read this book back in 2008 and it changed the way I view food and buy it. Lots of great information ranging from how our foods are processed, to how our chickens are raised and the conditions in which they and other livestock live. What I learned was truly appalling and I swore I would never buy Tyson, Purdue or anything Smithfield again… and I haven’t. The book also made me aware of ingredient lists and added vitamins and nutrients that should not be added to our foods. For example, pasta should say 100% Durum Wheat, not enriched Wheat pasta with Riboflavin, Thiamine Mononitrate, Niacin and Ferrous Sulfate. These are all additives that with a healthy diet we don’t need. I also started making my own breads and stayed away from anything with soybean oil, and contacted local organic farms in my area that have free range beef, eggs and poultry. I would suggest watching In Defense of Food on Netflix if you have the chance, along with Food , Inc. and Ted Talk’s with Jamie Oliver, who has been battling the war on sugar. Tuesday the 5th MyPeakChallenge is launching it’s 2016 challenge! We are all excited to see what other participants’ challenges will be and what MPC has in store for us. Our bodies and minds will adapt to new exercises, diets and more importantly a healthier way of life. I always find it so inspiring and motivating when you have others that you can participate with and share stories. So far, MPC has done an amazing job of tweeting and retweeting people’s goals, recipes, and words of encouragement. I thought long and hard about what my challenge would be and my girlfriends and I have decided to go hiking in Asheville, NC. One of the trails we will hike will be a total of 13 miles of steep terrain with picturesque views. My girlfriend Michelle who has been training with me for years, and who is also deathly afraid of heights, started hyperventilating as I was telling her what I would like for us to do! Of course she is on board and I promised her I would bring a flask of whisky for the climb, lol! Whisky makes everything good! But, joking aside, I know she will be fine and will face her fear of heights! That’s the great part about MPC! The challenge can be anything you want it to be! Everyone is different, we all have different levels of fitness. You don’t have to run a marathon, or climb 13 miles. And, how nice is it to know that you are not alone and that their are other’s starting from a level of fitness that you are starting from! And, those of you that follow me on Instagram, Twitter and Facebook know that I absolutely love to cook. alisa1203, @hintonalisa , Try it Before You buy It Girls So, I have included a few of my vegetarian recipes for you to make at home. Hmmm, maybe I should add a few cooking classes to the challenge too! That’s definitely something I have always wanted to do. In the meantime, enjoy…. I woke up one day and decided to make a change. I ran my first 5K back in 2000 when my Mom was first diagnosed with Breast Cancer. Maybe that was the turning point for me? Seeing someone so healthy diagnosed with cancer scared me. I wanted to help the cause, and join the fight. I remember running my first mile and being elated. That one mile inspired me to run more and do more. By the age of 26 I had joined the Master’s Swim class at the YMCA, and swam along side Olympic trial athletes. It was so hard to keep up, but I knew practice would make perfect so I stuck with it and eventually entered myself into a Sprint Triathlon. From there I decided to enter and compete in a Half Iron-man. The swimming portion was a breeze and from there I competed in other open water swims, other triathlons, and runs. Eventually, I became a personal trainer, opened a company called WeTRIsports and trained and educated many people in the Wake Forest/Raleigh area to swim, run marathons and cycle. It is such a wonderful feeling to see someone who may be scared to put their face in the water complete a triathlon, or not be the last person getting out of the pool. When you spend months with someone you get to know them on another level, you get to know what motivates them and what their goals and aspirations are. I feel very privileged to have made such wonderful relationships and friendships over the years. My passion is helping others….I now realize that.